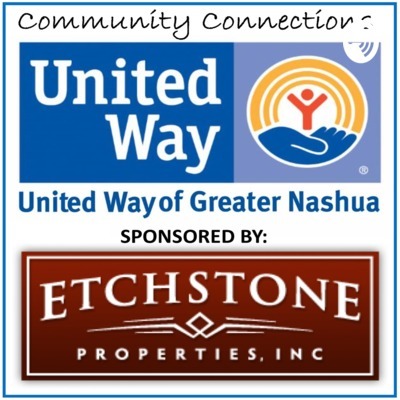 Connecting nonprofits to the community... the United Way Community Connections Show is the place to learn about the MANY fantastic nonprofits serving Greater Nashua. Interviews with Home Health and Hospice Care and Granite State Children's Alliance. Also, special guest Mia F. reading her essay on mental health. Interviews with Acentria Care Alliance's Good News Garage as well as Radiation Center of Greater Nashua. Interviews with Girls Inc. and Bellknap CAP Senior Companions Program. Interviews with the Nashua Division of Public Health and Community Services, La Leche League, and Northeast Deaf and Hard of Hearing Services. Interviews with Helping Hands Outreach and Neighborworks Southern New Hampshire. Interviews with Gateways Community Services Adult Programs and Southern New Hampshire Services Employment and Workplace Programs. Great interview with New Hampshire Challenge! Interviews with Amy Jo from Bridges Domestic and Sexual Violence and Tom from Nashua Honduras Outreach Team and Positive Street Art. Interviews with Nashua Community College and St. Joseph Hospital Community Health Education. Interviews with New Futures and the NH Childrens' Behavioural Health Collaborative as well as the Our Place program of NH Catholic Charities. Interviews with Mark from Partnership for Successful Living / Safe Stations, Eric and James from The Caregivers, and Gabrielle from the Leukemia and Lymphoma Society. Interviews with the Partnership for Successful Living, Harbor Homes, Boys and Girls Club of Greater Nashua, and World Academy. Interviews with 16 of our best friends! Starting at about 12 after and every 15 minutes or so, listen to interviews with John Elias, JDog Junk Removal, Peter Chaloner, United Way Board, Ken Grabeau, Monarch Instrument and Rotary International, Harry Cheema, Mr. Macs Mac and Cheese, Ken Sheldon, Bank of America, Greg McAdams, UFO Party Rentals, Andy Armstrong, Pastor, First Church Nashua, Rita McCabe, SubZero Ice Cream, Adam Marcoux, Nashua Teachers Union, Bob Larmouth, United Way Board, TJ Howley, Sentry Roofing, Denyne Sanville, Denyne Designs, Michelle Krall, Bellman's Jewelers, Steve Dalton, Dalton Electric, Paula Moran, BAE Systems and United Way Board, and Andy Whigham, Edward Jones Advisors. Interviews with Boo Martin from I Martin Associates, Rosemarie Dykeman from Salvation Army of Greater Nashua, and Melissa Boyle from Opportunity Networks. Interviews with Harry from Mr. Macs Mac and Cheese, Gate City Bike Coop, and Greater Nashua Habitat for Humanity. Interviews with Easter Seals of New Hampshire and Joseph's Closet of St. Josephs Hospital. Interviews with Adam from the Nashua Teachers' Union and the Nashua High South Student Leaders of "Meals Matter." Interviews with Casey Caster from Big Brothers Big Sisters of New Hampshire and Rick Rutter from the Southern New Hampshire Rescue Mission. Interviews with our friends from Bar Harbor Bank, End 68 Hours of Hunger, and Nashua's Division of Public Health and Community Services. Interviews with Sara Ceaser from United Way and our great friends from Operation Delta Dog. Interviews with IMSanta / New England Santa Society's Dan Greenleaf, Teen Institute's Julie Yerkes, and Daniel Webster Council / Boy Scouts' Executive Director Jay Garee. Enjoy the show! Interviews with the Leukemia and Lymphoma Society, the Partnership for Successful Living, and Southern NH Services' WIC Program. Interviews with Nashua Rotary West (Duck Derby! ), John Jurczyk, President of St. Joseph Hospital, and Shamera Simpson and Lisa Riley from the American Foundation for Suicide Prevention. Interviews with Heather Henline from the Nashua Telegraph, Randy Pierce from 2020 VisionQuest, Geralyn Ciardelli from the Dash for Recovery, and Mel Moran from the Partnership for Successful Living / Harbor Homes. Interviews with Sal from EmbroidMe, New Hampshire Teen Institute, and Southern New Hampshire Services / Head Start. Interviews with the American Foundation for Suicide Prevention, Main Street United Methodist Church, and the Youth Council. Learn more about who we are, what we do, and how YOU can make a difference! Interviews with Southern New Hampshire Services regarding Fuel Assistance and Volunteer Services as well as with Charles Okorie of the THANK YOU PROJECT and the upcoming Water Walk at Greeley Park. Interviews with Pathways Navigation, Souhegan Valley Boys and Girls Club / CAST, and the Parent Information Center. Interviews with Elaine Saunders from Dynamic Introductions about what she does and how she gives back; Brian Huckins from NAMI-NH about youth programs for mental health; Tracey Lane from the Partnership for Successful Living about some of their amazing career opportunities. Interviews with Matt Lefebvre from Elm Grove Realty about how he "gives back" to the community and then have non profit interviews with St. Joseph Community Services Meals on Wheels and St. Joseph Hospital Community Education.